What better way to start 2015 than to have our framed Core Values on the wall. Now that my wife and I have identified and articulated our guiding core values, next challenge would be to bring these principles to life – to incorporate them in everything we do and translate them into action. I’m personally very excited about its potential impact on how we do things at home. I’m saying "potential impact” since it’s just our first year together and I don’t want to pretend like what I’m saying is based on experience. 1) Making sure everyone is on the same page – how everyone is expected to be involved and aligned. When the time comes, I hope we wouldn’t have to resort to threatening our kids that the “aswang” will eat them if they don’t eat vegetables or bribing that they’ll get a toy if they do. 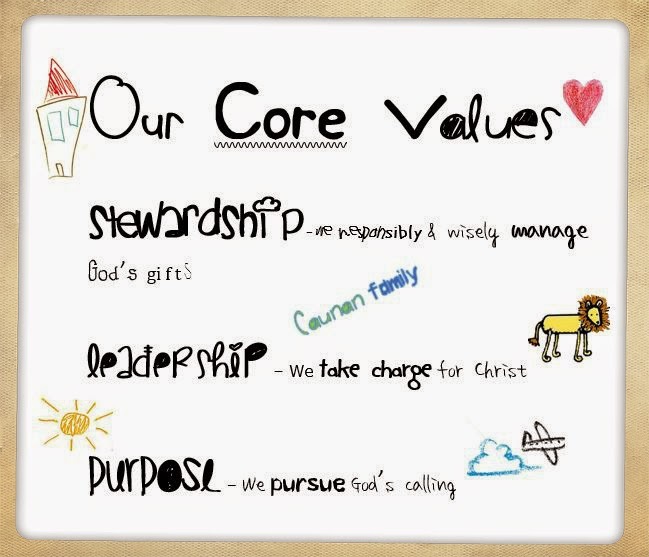 Instead, I hope they’ll do what they've got to do, understanding that following these core values is a means of loving God back for He's the one who loved us first.